It was nearly 3am. I was huddled in my home office waiting for the HyperCard installer to finish. It had taken a long time just to extract the installer. I didn’t have high hopes. At last, the installation completed. I had HyperCard up and running on my Macintosh System 7.5.3. 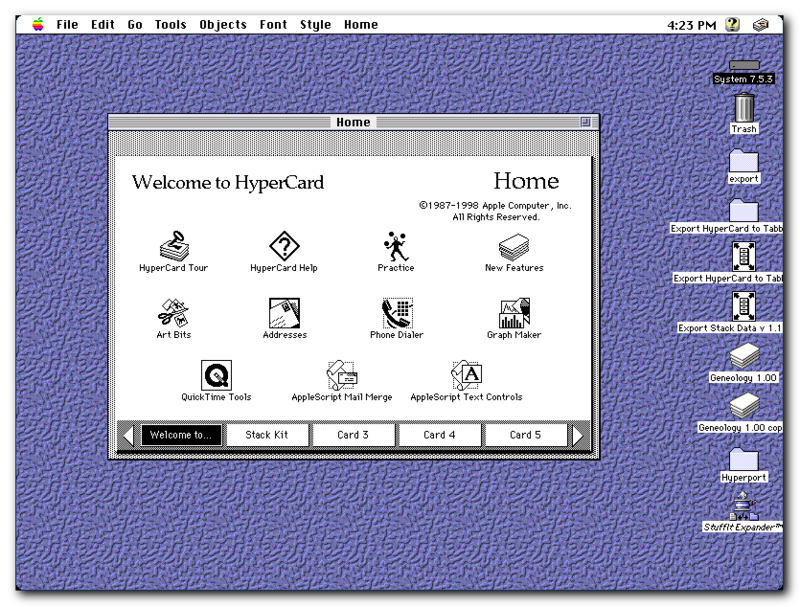 HyperCard was released for free on all Macs in August 1987. It was a smashing success with users. Sadly, by 2004, after numerous attempts to restart HyperCard development, Apple abandoned the project entirely. Why should you care about a defunct Mac application from the late eighties? Because you could be in the same boat as my uncle was in a short five or ten years. My uncle had spent an entire week with his mother (my now deceased grandmother), creating a detailed family history in HyperCard. Sourcing family Bibles, grave stones, letters, word of mouth and her memory, the information would be extremely hard to replace. Last year, he asked if I could help him get the data out of HyperCard. This is what led to me installing HyperCard on a Mac emulator in the wee hours of the morning in May of last year. I was able to access all of the data and convert it to text, but it took several hours and was not an easy process. Is the exported data in an open format? Whenever you invest time and effort entering valuable information, you should be able to get it out again. For instance, if you took a few hundred pictures on your smart phone, you would want to be able to transfer those pictures to your computer. By the same token, if you spend time creating lists of contacts, bookmarks, passwords, stories or any other type of content, you should be able to move that content somewhere else if you choose to. Some software creators don’t want you to take your data elsewhere, so they attempt to use vendor lock-in as a form of customer retention. Vendor lock-in is bad news, but you can avoid it by checking for the ability to export your data before you use it. If you can’t export your data, you will be at their mercy. If the software is abandoned, or the company is bought, or the creator passes away, you will have a progressively harder time using the software as time goes on. If anything happens to the software, you want to be able to get your data and move it somewhere else. Do They Use Open Formats? The format of what you’re exporting is the second piece of the puzzle. Being able to export is essential, but you also need to be able to read the exported data in the future. Open formats have a public specification that anyone can access. In short, it means you’ll be able to read your data. Plain text is the ultimate open format. You can easily open and view a plain text file from 40 years ago without a problem. Other open formats include HTML, RTF, CSV and XML. Closed formats are secret and proprietary. They can be reverse engineered, but that is a time-consuming and difficult process. [Prodigy](https://en.wikipedia.org/wiki/Prodigy_(online_service)), an online service from the 1990s that once had hundreds of thousands of subscribers, used closed formats. Fifteen years after they pulled the plug, efforts are underway to access the data. Even if you still have data files from Prodigy, they’re useless until you can access the content. To give you an idea of what you can do with open formats, my blog has gone through three migrations. In each case, I was able to migrate my blog posts and comments because the data formats were open, documented and easily accessible. I’ve gone through similar migrations with outlining software, RSS readers, bookmarking services and databases. You should also consider the media you’re using for your exported files. If your data is stored on an audio cassettes, VHS movies or floppy disks, you’re going to have a hard time reading the files. You need to have a device that can read the media in order to migrate to something more modern, like CDs or DVDs. And when they become outdated in favor of BluRay discs and USB flash drives, you’ll move on to the next device. For all of Google’s faults, they do a darn good job at providing data export. They have a team entirely devoted to allowing you to export your data. Check out the Google Takeout Page to export your data from a variety of Google’s services. Facebook, on the other hand, is not nearly as willing to let you part with your data. When Michael Arrington asked to be able to export his friends’ emails he was told he didn’t own that information. Turns out you can export the list of your friends’ emails by going through a Yahoo account, but it’s a convoluted process. In summary, when you consider using an application (mobile or desktop), consider whether the information is important to you. If it is, make sure you can export your information and that the format is reasonably open, or there are simple ways to make it open. If not, I strongly suggest you look elsewhere.